Action learning, in the simplest definition, is a process based on a set of people who initiate creative solutions in tackling complex problems on individuals, groups of people and corporationsCorporationWhat is a corporation? A corporation is a legal entity created by individuals, stockholders, or shareholders, with the purpose of operating for profit. The creation involves a legal process called incorporation where legal documents containing the primary purpose of the business, name, and location. Action learning is an effective approach of development at all levels such as individual or organizational. Organizations that both value the development of their employees and take care to facilitate action learning receive the benefits of a more talented and empowered workforce. Many such successful organizations use action learning to achieve workforce development. The originator of action learning, Professor Reginald Revans, found that setting a small group of people to share their experiences and problems to find a solution was an effective method. He used his method of action learning as a support system for management development to revive several dying organizations during his time. When the set meets, the first thing they are likely to do is to elect one of their own to be a leader, or also known as a facilitator. Serve as an intermediary between the management of the organization and the set members. At first, Prof. Revans was against naming a facilitator for the set. He was worried that the set might rely entirely on the facilitator and become docile. He later changed this assumption and accepted the idea of naming a facilitator in the set to manage the basic processes. What made him change his mind is when he realized that a set without a facilitator emphasizes too much on actions with less learning, which was not his intended outcome of action learning. Once the meeting is over, the set members are expected to implement all that was discussed as a solution to the current problems. Some solutions may involve bringing other teammates who were not a part of the set group. It may require sensitivity when handling and explaining the solution to the non-set member, but will also lead to an overall stronger team. Members of the set team will need to report back to the set on the next meeting on what changes were encountered while implementing the solution. Members are expected to exchange ideas on the findings and help each other in formulating subsequent solutions to implementations that failed or did not yield positive results. What did you do? – The speaker will narrate to the other set members how they went about implementing the solution. What happened? – The speaker will state the reaction of their colleagues when they brought their colleagues into the picture of how they wanted to change the approach on doing some of the duties. Was it any different from expectations? – State expectations and whether the results were negative or positive according to those expectations. Was the set member able to implement all solutions from the previous meeting? If not, what and how that implementation could have been handled. Define the lesson learned from the action. From the report, the facilitator can now propel the meeting to discuss the issues. The process puts the set members into another iteration of the action learning procedure. However, action learning is now meant to address new questions or problems. The facilitator may need to put the following questions to the set members to form a basis of handling the question or problem at hand. What action should be taken after learning the issues? What action points should they identify in order to solve the issue? As seen above, the action learning process is a cyclical one. Each iteration of the action learning procedure is meant to gradually improve business process and fix problems, similarly to how the agile methodology works in software development. 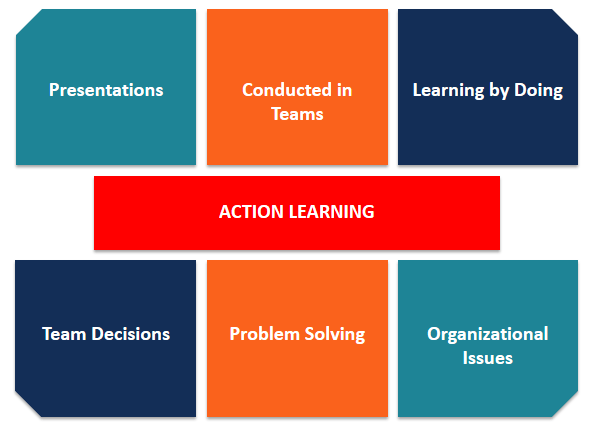 Action learning has taken over the world in managing high profile organizations, groups, and individuals. Apart from solving complex challenges in these organizations, Action Learning has become an icebreaker of tension that used to loom between executive management and the staff. This method has played a major role to bridge the existing gap between these two groups of staff members by bringing them together in working as one team. The action learning process is meant to initiate dialogue in seeking a solution. The process is expected to form cohesiveness, which will be a building block for the success of an organization. CFI is a global provider of corporate development courses and career advancement for finance professionals. To learn more and expand your career, explore the additional relevant resources below.